Yesterday, I sat and watched a kingfisher on the banks of a creek. When I first spotted the chocolate brown and blue bird, I didn’t know what it was. I wondered whether it was a kingfisher, and instinctively leapt up to check the Internet. But I couldn’t, because there is no Internet where I am. 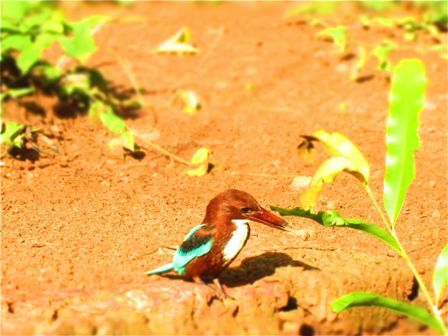 Instead, I sat with the bird a while longer and when someone walked by I asked, ‘Is this a kingfisher?’ The passerby said, ‘Yes. It’s going to bathe.’ On queue the kingfisher duck-dived into the creek and then flew into a tree. Once in the tree, it cleaned itself merrily, ruffling its feathers into a fluff. I am at an Ayurvedic health centre in Kerala, India. It is perched on a lake and my cabin is surrounded by a beautifully manicured tropical garden. Spectacular to look at, it is also the source of the Ayurvedic medicines used in the treatments. It’s the low season in India, so I am sharing this tropical paradise with only one other guest – a social worker from Germany. On my first night here we talked about her smartphone, which had broken. I agreed it would be good for me to “go turkey” from the Internet for a while too. I added coffee to the list of things I needed to go turkey from. She added chocolate. A few weeks ago I read an article about how using smart phones was affecting our capacity for empathy. I would link to the article here, but I don’t have the Internet. If I recall correctly, it asserted that because we interact more with our screens and less with people face-to-face, it is weakening the part of the brain that controls empathy. In a way, our empathy muscles are atrophying through lack of use. If there were a scale to measure someone’s human engagement skills (there probably is, somewhere on the Internet) I would probably measure fairly highly. Yet I still find small talk with strangers, networking events and making telephone calls torturous. At parties, I use my smartphone as way to disconnect briefly from social interaction in the way people used to go outside for a cigarette. I busy myself with Twitter in the way I once might have busied myself admiring the artwork on someone’s walls. It has become a crutch for me, a little cubby of social isolation I can hide in when I want to. I can imagine the temptation must be even stronger for those who find most social interaction truly difficult and tiresome. However comfortable, I can see that I am losing opportunities to connect with humans face-to-face. The more often I retreat the harder connecting becomes. I’ve known for a while I needed to cut back on Internet usage. Unfortunately, disciplined use of technology is not a skill that comes naturally to me. When I try to limit my own access to the Internet, I develop elaborate excuses to break my own rules…like a true addict. But, here there is no Internet, so discipline isn’t the issue. Going turkey has been much easier than expected. I don’t miss Twitter at all and those moments when I simply must use the Internet to research something have disappeared. In just a few days without the Internet to hand, I have asked more questions of real humans (the answers, by the way, have been far more sensible than anything I’ve read on Yahoo!Answers). I have read books instead of scanning blogs. When a light bulb has lit up in my head, instead of searching Google for similar ideas, I have picked up a pen and paper and sketched it out. I still have technology – my laptop, mobile phone without Internet, and a kindle –so I’ve hardly become Amish. And yet, my days feel so much more spacious and relaxed. I will have the Internet on steady flow again before long. No doubt I will go back to using it a lot…too much. But I will remember to leave my phone in my bag at parties, and force myself to stare at the artwork on the walls instead of at Twitter. I might even leave my phone at home from time to time. Who knows: without the Internet getting in the way, I might just learn something. This is great! It happens at the end of every month that I exceed my data allowance on my phone. I refuse to pay for extra downloads, so for a couple of days I turn 3G off. Thinking about it in the context of your article it is incredible how much more productive I am for those days. Maybe I will switch off more often. Thanks Sarah! Julia, I love this in-built switch off period you have. I’m going to try to build one in for myself too. This entry was posted in Life and tagged 99 tips for a better world, india, life, travel. Bookmark the permalink.